What is the safest and easiest way to cook a turkey outdoors? Well, you can deep fry, smoke or grill your bird using the proper cooking tools. 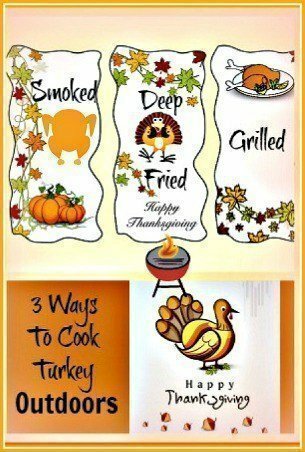 You can use a smoker, a grill or a turkey fryer depending on the weather conditions. Cooking in your backyard can be a fun and enjoyable family affair. The delicious flavor of a deep fried, grilled or smoked turkey cannot be replicated in your indoor oven. Besides, it frees up your oven space for your other festive dishes. Whether you grill, deep fry or smoke your turkey outside, safety always come first. Whether you’re using the oil less propane turkey fryer or the one using oil, no doubt, you’ll be serving your guests one of the best fried turkey ever eaten. Fried turkey with its crispy skin and moist juicy meat has always been popular among my guests and I’m sure yours too. When frying with oil, make sure turkey is fully thawed and dried. Oil temperature should reach 350°F before slowly lowering your bird into the hot oil. Estimate about 3 – 5 minutes per pound for turkey to be cooked. Most propane turkey fryers come with a 15 minute timer that will automatically shut down if it is not manually reset before the 15 minutes are up. This safety feature will certainly keep you close by your fryer. The good thing about the oil free turkey fryer is that you have no open flame to worry about. No expensive oil to buy, filter and keep either. Infrared heat is used to cook the bird. Compared to the propane fryer that uses oil, the oil free infrared turkey fryer is safer and mess-free. Grilling requires serious heat besides your premium fresh bird. High heat lock in the juices, resulting in a juicy, tender and succulent turkey. You get the choice of a gas, charcoal or wood pellet grill. Or perhaps go the traditional way using fire wood. You’ll want to use indirect heat to grill your turkey. Just like roasting your bird in the oven using indirect heat, the heat on the grill comes from either side of the meat and not directly underneath it. The whole bird is cooked by warm steamy air circulating around it. It is placed away from the flame. Indirect heat grilling is like slow roasting your bird. When using a covered charcoal grill, estimate about 15 – 18 minutes per pound of meat. 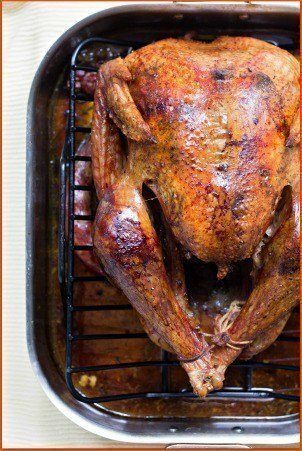 Place your turkey in the center of the grilling grate (breast facing up) with a drip pan directly underneath it to collect turkey drippings. Put charcoal on the either side of the pan for indirect heating of the bird. When you notice white powdery ash on the burning charcoals (estimate about 20 – 30 minutes from start of starting the fire), and air temperature inside grill reaches between 225 – 300°F, then it’s time to start your grilling. You might have to top up the charcoal pieces if temperature drops. Make sure the internal temperature at the thickest part of the breast reaches 165°F for the bird to be considered safely cooked. A meat thermometer inserted into the thickest part of the thigh (not touching the bones) should read 180°F when fully cooked. Cleaning out the ash is not an easy job. Look for one with removable ash tray. For indirect heating purposes, the 3 burners gas grills work best. Compared to the charcoal grill, the turkey sits on the dripping/roasting pan which is placed on top of the grate instead of below. The left and right side burners can be easily adjusted to the preferred temperature of 350 – 400°F. Gas grills come with manufacturer’s manual for best cooking times. Grilling a 10 – 15 pound bird at 325°F takes about 3 – 3.5 hours. Smoke your turkey using a propane gas smoker, charcoal smoker, electric smoker or the wood pellet smoker. Smoking a turkey is a slow cooking technique – about 7 hours using the Traeger wood pellet smoker grill. However, it’s pretty hassle-free and simple to use. Grilling with smoke seals in the natural flavors of your meat. When smoking the turkey, rub a bit of butter on the skin to get a crispier effect. Smoking tends to make the skin rubbery. Depending on the ambient temperature, it can take about 30 – 40 minutes for the charcoal smoker to reach 350°F. The smoker temperature should be between 225 – 300°F for smoking a whole turkey. Estimate about 30 – 40 minutes per pound to smoke a delicious bird with crispy skin and juicy meat. A 20 pound bird can be ready in about 8 – 12 hours. The inner thigh temperature must reach 180°F. Put the pellets in the hopper box, set the temperature and the smoker takes over. Remember to check your bird with the meat thermometer. You can’t really go wrong with the pellet smoker. Pellet grills impart a smoky flavor and wood-fired taste to your food. Some come with a searing feature. You get to sear your meat and seal in the flavor. Propane smokers are easy to use. Set the temperature and the smoker takes over. You can use a combination of wood and charcoal. You need to be more involved for charcoal smoking – start the fire, check the charcoals and managed the temperature at 225 – 300°F. Try not to use self-starting charcoal that has lighter fluid additives. These are easy to use. It makes use of a heating element that needs little intervention once the machine is switched on. Just set the time and temperature and the machine takes over. Some of the modern Wi-Fi connected digital electric smokers are really easy to use. The smart smoker comes with an app that gives you notifications on the necessary steps at different stages of the cooking procedure. The app will let you know the perfect time to put in your turkey and the best time to take it out. A turkey is a big bird. It tends to be on the dry side if not properly seasoned. A butter injection would make a lot of difference. It can be just a simple mixture of melted salted butter, black pepper powder and garlic powder. No matter which method you choose to use, you’ll have lots of fun if you decide to cook a turkey outdoors.